Ramps arrive in the East Coast well before good basil can be found, so I’ve adapted a classic cool-weather pesto from Liguria, in Northern Italy, that uses walnuts and parsley instead of basil and pine nuts. Only, in this case, I am substituting the garlic in that pesto for fresh ramps, which are a kind of wild onion that has a pronounced garlic flavor. How to Keep Your Pesto Green! I blanch the greens first to keep them vivid; if you don’t do this, your pesto will oxidize and turn brown in a few hours unless you cover it in olive oil. If you can’t find ramps, use green garlic. Both are available at farmer’s markets in spring, although ramps are tough to locate west of Minnesota. In the photo above, the ramp pesto served with white ends of ramps, sautéed in olive oil and sprinkled with lemon zest. Use can also your ramp pesto just as you would any other pesto: toss it with pasta or in a risotto, spread it on burgers and sandwiches, swirl it into a bowl of soup, or serve it with eggs. Keep the pesto covered in the fridge with a thin layer of olive oil over it, and use within a few days. For longer storage, freeze for up to three months. Serve this pesto like you would any other: With pasta or in risotto, on crusty bread or as a dollop in soup. 1 Toast the walnuts: In a dry frying pan over medium heat, toast the walnuts. Toss from time to time, until you can smell them, about 5-7 minutes. 2 Blanch the parsley and ramp greens: Bring a large kettle of salty water to a rolling boil. Fill a large bowl with ice water. Blanch the parsley in the boiling water for 1 minute, then submerge it in the ice water (shocking the parsley with ice water will keep it bright green). Cut the leaves off the ramps, leaving the white parts for another use. Blanch the ramp leaves in the boiling water for 30 seconds. Douse in the ice water. 3 Wring out excess water: Drain the parsley and ramp leaves, then put them in a kitchen towel. Wrap the towel around the greens, and twist one end of the towel one way, and the other end of the towel the opposite way. Wring out the parsley and ramps tightly. You want as much water as you can to drain away. 4 Blend in food processor: Chop the parsley and ramps well and put into the bowl of a food processor. Chop the walnuts well and put them in, too. Add the parmiggiano cheese and a healthy pinch of salt. Pulse the mixture together a few times, then, with the motor running, drizzle in the olive oil slowly. Stop the food processor immediately after the oil is incorporated. Taste for salt, and add if needed. Serve within a couple days. For storage, keep covered in the fridge with a thin layer of olive oil over it. Freeze if you will have any left over after 3 days. Hello! All photos and content are copyright protected. Please do not use our photos without prior written permission. 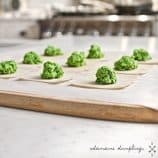 If you wish to republish this recipe, please rewrite the recipe in your own unique words and link back to Ramp and Parsley Pesto on Simply Recipes. Thank you! Is there anything better than creamy pasta? How about creamy tomato pasta! 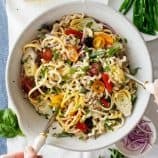 I’m so excited about this recipe because it is basically everything I want to eat for dinner any night of the week. 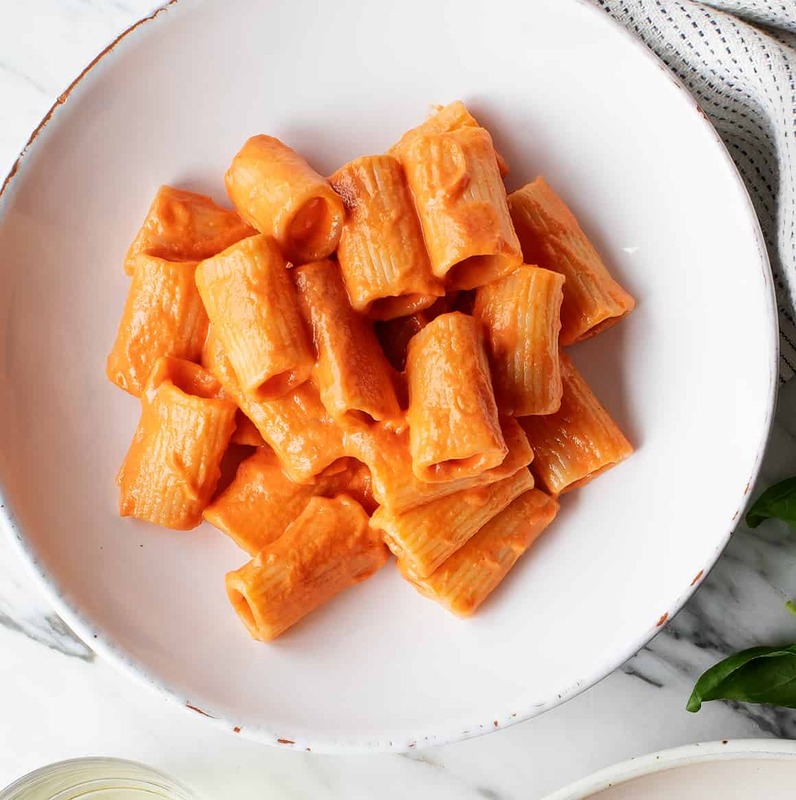 Big, hearty, rigatoni noodles are coated in a tangy, luscious creamy tomato sauce. Plus, it’s a healthy bowl of pasta because there are quite a few yummy sautéed vegetables mixed in here as well. 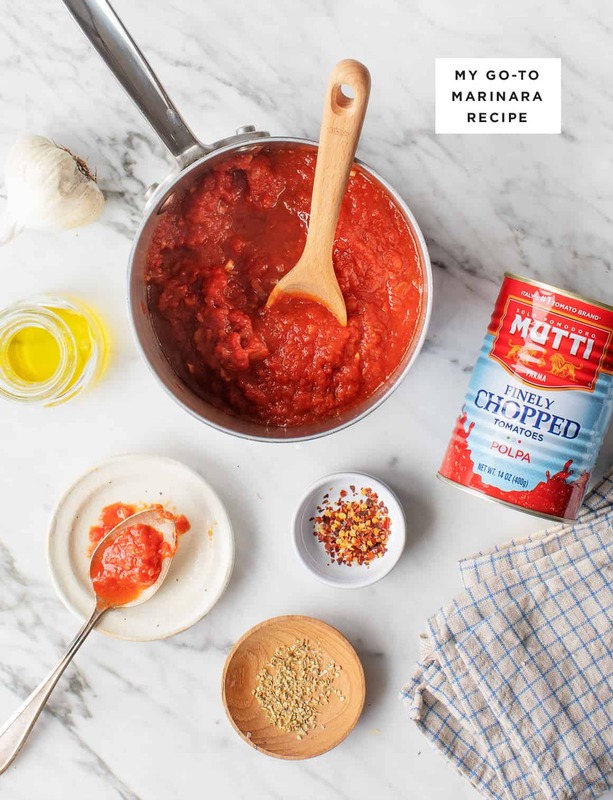 This post is in partnership with Mutti Tomatoes, Italy’s #1 tomato brand, which is perfect timing because we are really craving summer food over here… even though it’s only April and summer is still a while away. 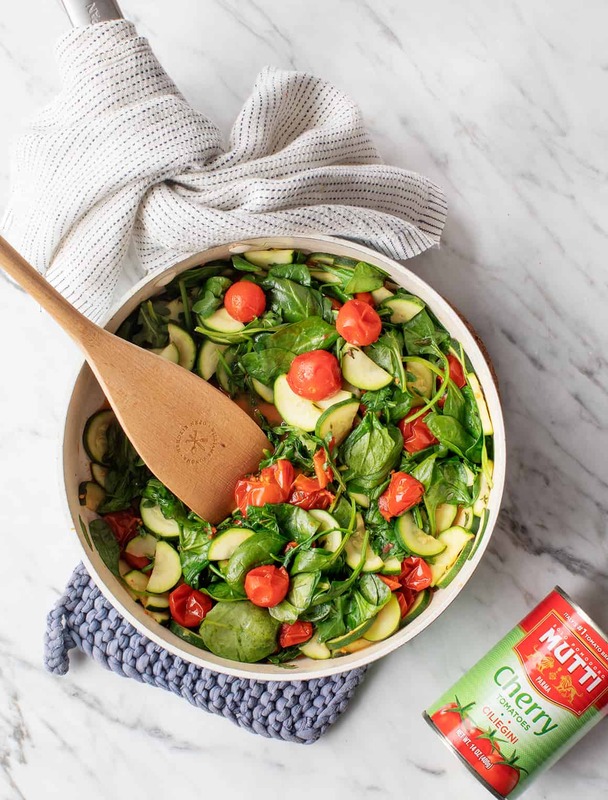 Thanks to Mutti, we can dream of Italian summer nights with their fresh-tasting 100% Italian tomatoes, which are picked at their peak ripeness and packed with only a pinch of sea salt. This recipe is a two parter. The first part is my go-to Marinara sauce. 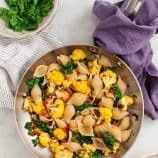 Aside from using it to make the creamy pasta sauce in this final recipe, it’s a simple, quick pantry-based recipe that you should keep in your back pocket. It’s delicious on pasta, pizza, or even spaghetti squash. 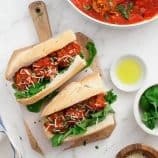 Everyone needs a basic marinara recipe and this one is mine. Now to make marinara just a little bit more exciting… we’re blending it into a creamy pasta sauce! Oh, and I forgot to mention, we’re not using cream or cheese… but no one has to know that. 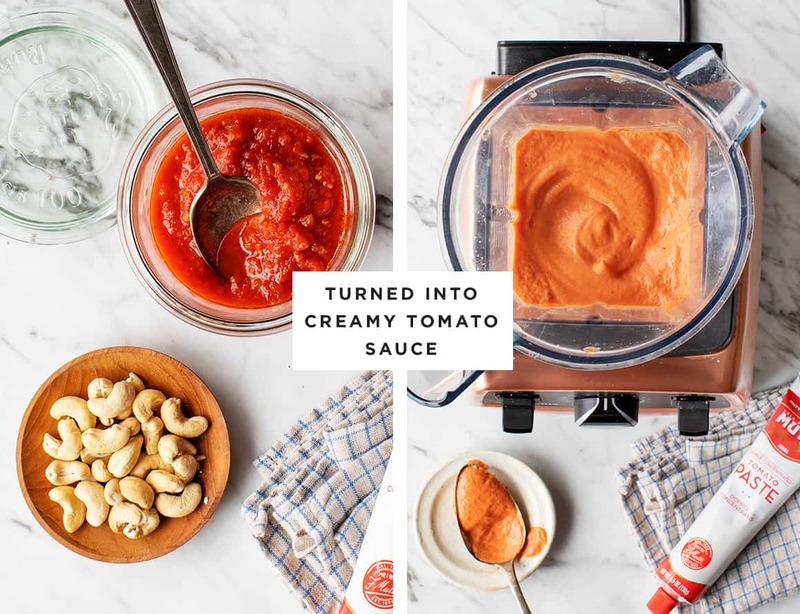 To make the creamy tomato sauce, simply blend the marinara with cashews and tomato paste. For this recipe I use Mutti Double Concentrated Tomato Paste. 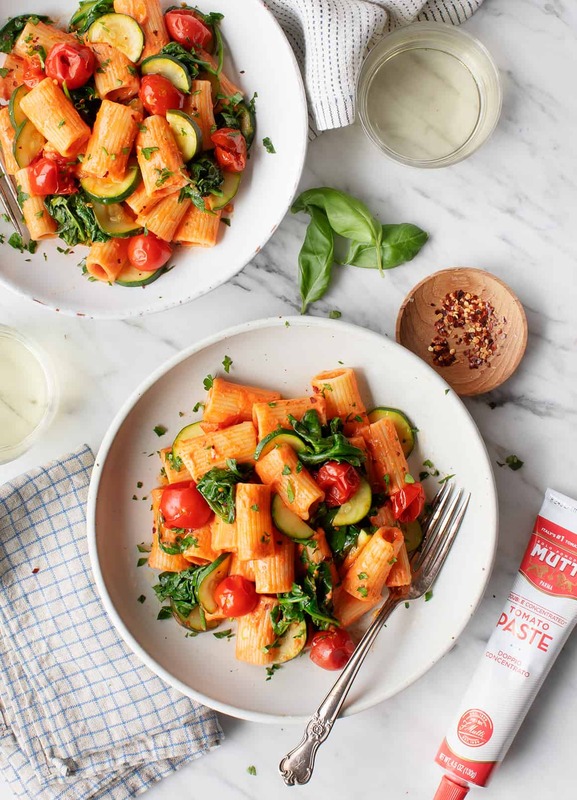 This is not any ordinary tomato paste – this tomato paste is so wonderful because it comes in a tube instead of a tiny can! I often like to use just a little bit of tomato paste to dramatically punch up flavors in sauces and soups. It’s SO convenient to be able to use a tablespoon and store the rest (it lasts a really long time) without having to make use of an entire can. Because this is a vegetable blog, I like to serve my pasta with equal parts vegetable. 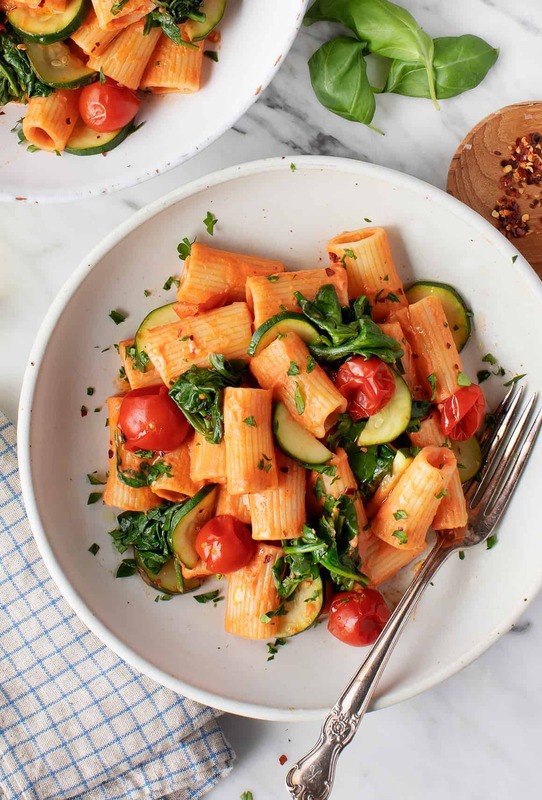 Zucchini, spinach, arugula, fresh thyme, and Mutti Cherry Tomatoes make this creamy pasta pomodoro light and fresh. Take a look at that creamy sauce! I hope you love this recipe, but that’s not all I have for you today – we’re giving away a fun tomato prize pack to one lucky winner! The giveaway: includes a wide variety of 100% Italian tomatoes and other fun gifts from Mutti. To enter: Leave a comment below telling me what you love to make with tomatoes! We’ll choose a winner at random on 4/30/19. US addresses only. The post Creamy Pasta Pomodoro appeared first on Love and Lemons. 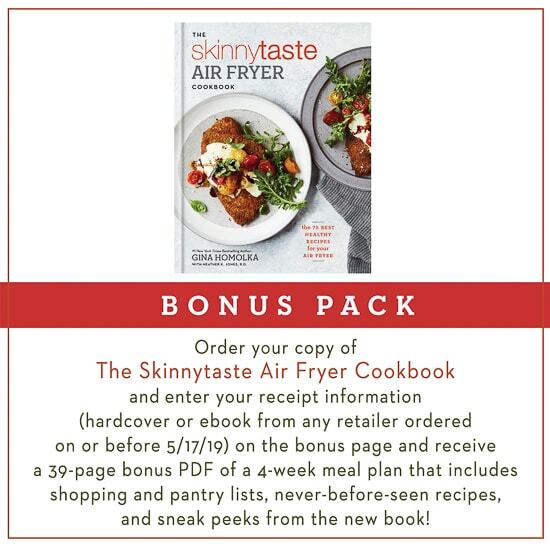 I’m beyond excited that in just a few short weeks my new cookbook The Skinnytaste Air Fryer Cookbook will finally be hitting bookstores May 7, but it’s available to pre-order now!! The first time I ate a breakfast taco, it was one of those “Why didn’t I think of this before?” moments. It’s everything you want to eat for breakfast, all packaged nice and tidy in a tortilla that you can eat with your hands. I make mine with Mexican chorizo, scrambled eggs, avocado, and cheese. Chorizo is my go-to choice for breakfast tacos, because it’s packed full of spices and flavors that go well with a taco. Chorizo sausage is common in a lot of different cultures, and there are a number of sausages that go by the name of chorizo. But the most common ones you will likely find at a grocery store are Mexican and Spanish. They aren’t interchangeable. Mexican chorizo, which is made from ground pork sausage and flavored with Mexican chile peppers, tends to skew slightly hotter in spice than its Spanish counterpart. It is also raw, so it needs to be cooked before serving. Spanish-style chorizo is primarily flavored with garlic and smoked paprika and often made with chopped pork sausage. It comes in two primary versions—one sweeter, one spicier. But more importantly, it’s often cured and dry aged, then served like a salami or pepperoni (without cooking), appropriate for a cheeseboard or charcuterie platter. In my breakfast tacos, I opt for Mexican-style chorizo, because I like its spicy flavor and soft texture in the tacos. If you find raw Spanish chorizo, feel free to use it in place of the Mexican for the breakfast tacos—but realize it will be more garlicky, smokier in flavor, and less tender, because the pork is chopped, not ground. If you end up with cured Spanish chorizo, just chop it into small cubes and toss it into the scrambled eggs at the end to warm it up. You can also easily swap the chorizo out for bacon or breakfast pork sausage. The tacos will be just as great, albeit with a different texture and flavor. Keep in mind, however, that regardless of which chorizo you choose, the spice and salt factor could vary quite a bit—that’s why I’ve called for a modest amount of salt and pepper for the scrambled eggs. Season, cook, and taste, and then season again if needed. You can brown the chorizo in the evening and refrigerate it in a covered bowl. You can also chop the tomatoes and pick the leaves off the cilantro stems the night before. You can even prep the avocado up to eight hours ahead of time; just be sure to toss it in lime juice, which will prevent the avocado chunks from browning. If you prep all the ingredients ahead of time, all you need to do in the morning is scramble the eggs and warm up the tortillas, then assemble the tacos for an easy, hot breakfast. You can also easily double this recipe to feed guests or a brunch crowd! Of course, for a fancier weekend brunch, you can up the ante and make a buffet of toppings. I’ve added my favorites below in the recipe, but the list is endless. Create a spread and have your guests pick and choose their own toppings for their own customized breakfast tacos! What Kind of Tortilla Should You Use? Like everything else, the choice of tortilla is up to you. I like a tortilla that is made with a mix of corn and flour, like this one. The flour gives the tortilla “bendability” while the corn adds flavor. But if you are a fan of corn (or want to keep the breakfast taco gluten-free) just go with a corn tortilla. You might want to double the tortillas though (stack two on top of each other before filling) in case the top tortilla cracks when you pick it up. Flour tortillas aren’t as liable to crack. My preferred method for heating up tortillas is in a dry, hot skillet. They only take 15 to 30 seconds per side, and the surface gets a little crisp and charred. There’s plenty of time to do this as you scramble the eggs. If you prefer a softer tortilla or want to heat them all up at once, just stack them all on a plate, cover with a damp paper towel or cloth, and microwave for 30 to 60 seconds. Leave them stacked and covered while you assemble the tacos. MORE FAVORITE MEXICAN BREAKFAST IDEAS! 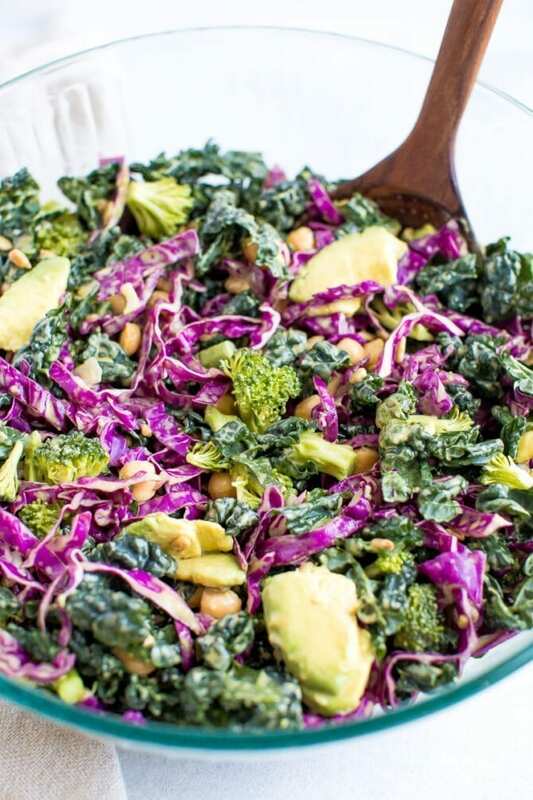 A crunchy kale and cabbage salad with broccoli florets, chickpeas and sunflower seeds all coated with a light nutritional yeast dressing. Vegan, gluten-free and paleo! In case you haven’t noticed, I have a tiny crush on kale. I like to have it on hand every week to make something green. Some of my favorites include this garlicky kale salad, this detox salad, a kale and feta quiche or even a green juice or green smoothie… I’ll stop there because I think you get my drift. Anyhow, this week I decided to stray from my normal kale recipes and I came up with something new. 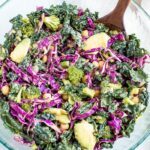 It’s not revolutionary as it’s just a kale and cabbage salad, but the ingredients are quite cleansing and the dressing is super simple to make, yet still robust with flavor. I think you’re going to love it! 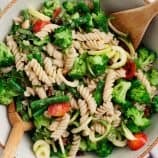 One awesome thing about this salad is that it is loaded with a cruciferous vegetables, which are known for their health benefits. These vegetables are nutrient dense and low in calories. 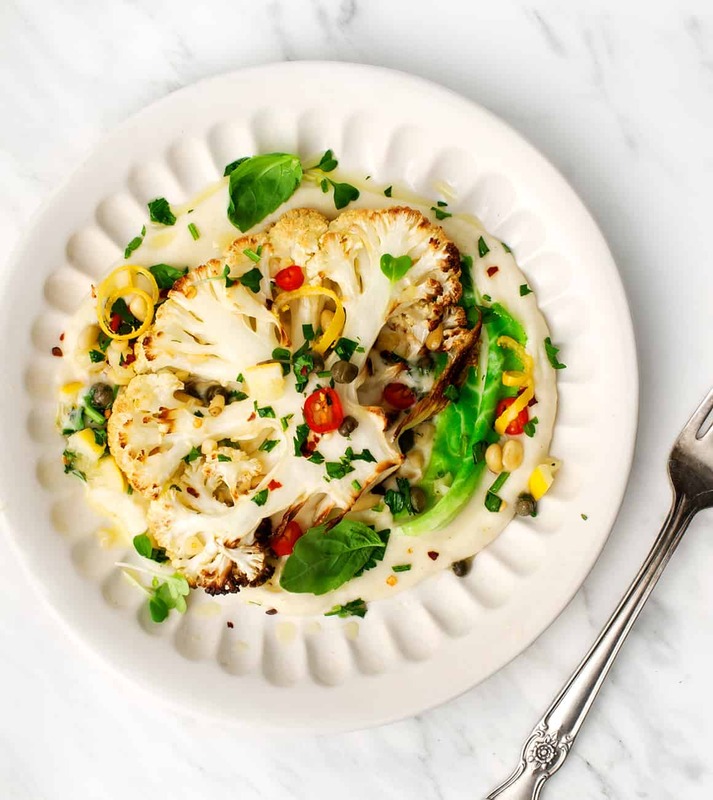 Each vegetable has a different nutrition profile but in general cruciferous vegetables are usually packed with vitamin A, vitamin C, vitamin K and dietary fiber. In addition, they contain glucosinolates, sulfur-containing compounds that provide cancer-fighting properties. I should also mention that although cruciferous veggies are packed with nutritional benefits there are some side affects. The first is that all the fiber in these veggies can cause gas and bloating. And when eaten raw these veggies release goitrogens through the digestion process. Goitrogens can increase the need for iodine and can cause damage to the thyroid gland. This is usually only an issue if you’re eating large amounts of cruciferous vegetables or if you have an iodine deficiency or thyroid disfunction. If this is the case you should only eat cooked cruciferous vegetables and limit your consumption. And as always talk to your doctor about this if you have any concerns. There are a ton of veggies in the cruciferous family including cabbage, kale, brussels sprouts, broccoli and cauliflower. For this salad we’re using kale, cabbage and broccoli. This blend is similar the Cruciferous Crunch salad mix, one of my go-to healthy staples from Trader Joe’s. Cruciferous Crunch has the same combo of veggies but also includes brussels sprouts. 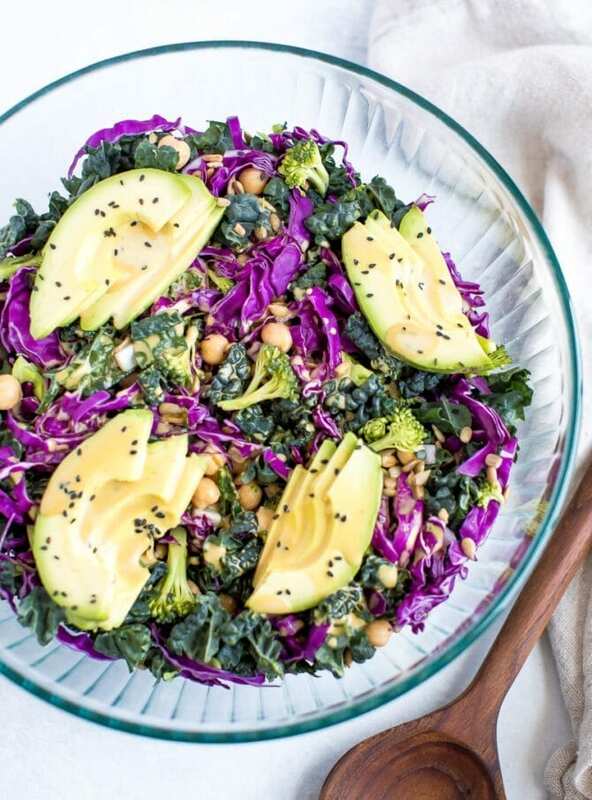 Pro tip: If you’re running low on time and want to skip all the chopping, you could totally use 2 bags of the Cruciferous Crunch to make this salad! What to do With Leftover Dressing? 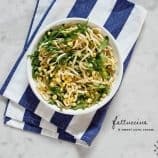 The recipe for the nutritional yeast dressing makes more than enough to dress the salad so you’ll have some leftover to use on other salads or as a topping for another dish. I can attest to the fact that this dressing tastes delicious on tofu, steamed veggies and quinoa. It would be delicious on this sweet potato brown rice bowl. If you make this kale and cabbage salad be sure to leave a comment and star rating below letting me know how it turns out. Your feedback is super helpful for the EBF team and other readers! 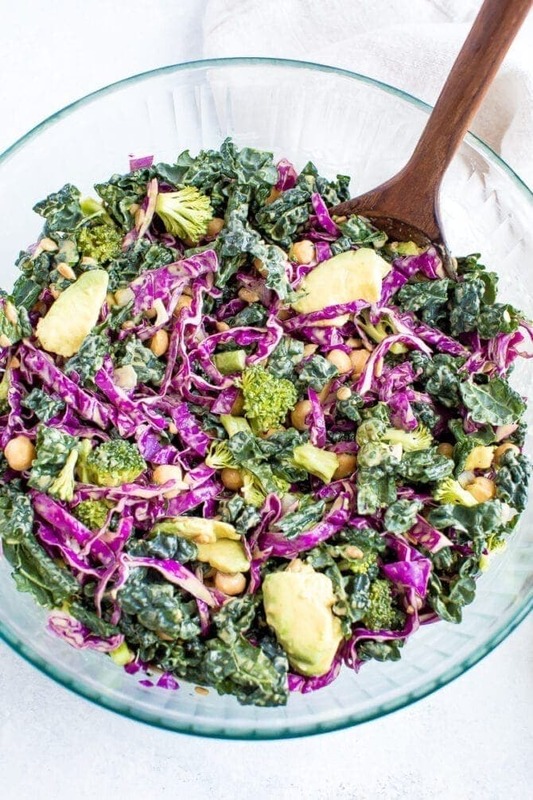 A lovely kale cabbage salad with broccoli florets, chickpeas and sunflower seeds coated with a creamy nutritional yeast dressing. Chop all your veggies into bite-size pieces and toss into a large bowl to combine. Toss in chickpeas and sunflower seeds and top with dressing (I used about 1/2 the batch, but feel free to add as much or as little as you’d like). Use your hands to massage the salad, toss with a large spoon or put a lid on the container and shake until the salad is well coated. The post Kale and Cabbage Salad appeared first on Eating Bird Food. 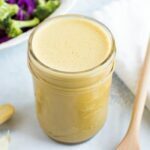 Nutritional yeast, alongside apple cider vinegar and garlic, gives this dressing an umami-rich flavor you can’t resist. You’ll find yourself wanting to drizzle it on everything! I’m a huge fan of homemade dressings and have posted a ton over the years! 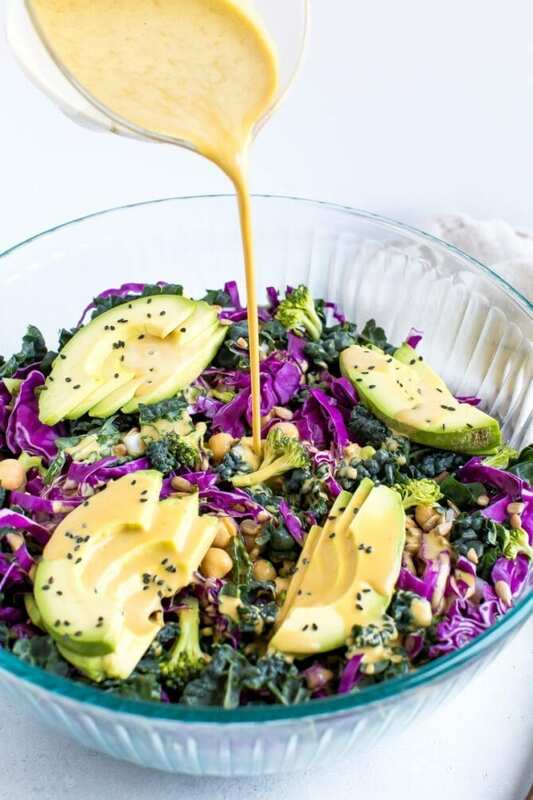 One of my favorites has always been this oil-free zesty tahini dressing with nutritional yeast. And this dressing is a spin-off of that one, only without the tahini and even more nutritional yeast. I originally created it as a dressing for my kale and cabbage salad but honestly, it’s delicious on just about anything. I like using it as a drizzle for steamed veggies and as a dip for baked chicken tenders. Nutritional yeast is an inactive yeast made from molasses. It’s yellow in color and sold as flakes, granules or powder and can be found in the spice section or bulk bins of health food stores. I typically buy Bob’s Red Mill large flakes from Thrive Market. Nutritional yeast has the word “nutritional” in its name for a reason! It is a complete protein – meaning it has all nine essential acids that we need! It is also high in protein (2g per tablespoon) so is a great way for vegetarians and vegans to add high-quality protein to their diet. It’s also is high in B vitamins, specifically vitamin B-12! Vitamin B-12 is needed for a variety of body functions, including red blood cell creation, DNA production, energy metabolism and healthy nervous system functionality. It’s naturally found in animal products, so vegans can become deficient if they aren’t supplementing (or eating nutritional yeast). Making a homemade dressing with nutritional yeast is super easy! 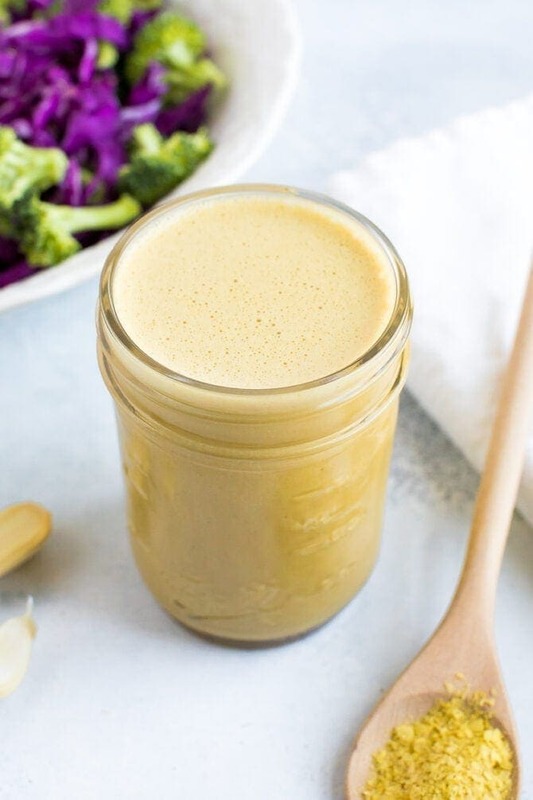 For this dressing, we’re simply adding the nutritional yeast, apple cider vinegar, coconut aminos, water, garlic and ground pepper to a blender and blending until smooth. Slowly add in the olive oil with the blender on low. If you don’t have a blender, you can mince your garlic really well and whisk all of the ingredients together in a bowl! 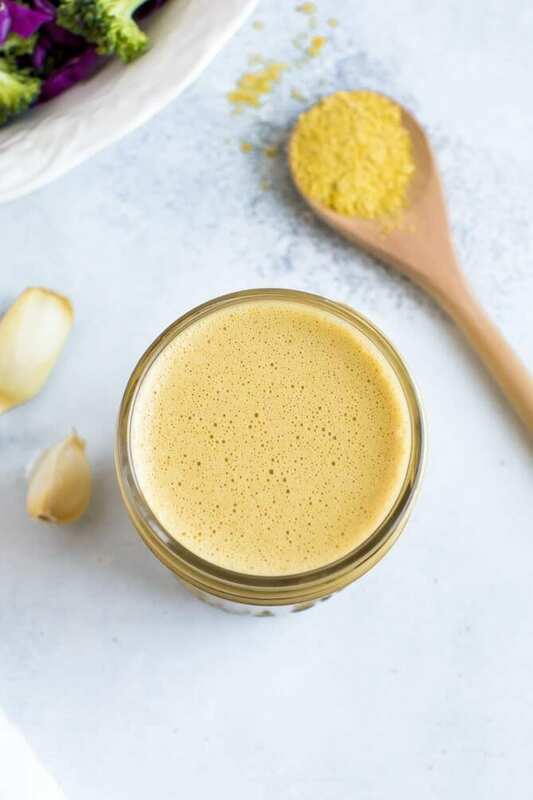 If you make this nutritional yeast dressing, be sure to leave a comment and star rating below letting me know how it turns out. Your feedback is so helpful for the EBF team and other readers. Combine all dressing ingredients except olive oil into a blender. Blend until smooth and slowly add in the olive oil, with the blender on a low setting. I prefer making this dressing in a blender because it gets extra smooth and creamy, but if don’t have a blender you can easily make it by whisking all the ingredients together as well. Just make sure you mince your garlic really well. You can use Bragg’s liquid aminos, low-sodium tamari or low-sodium soy sauce instead of coconut aminos. 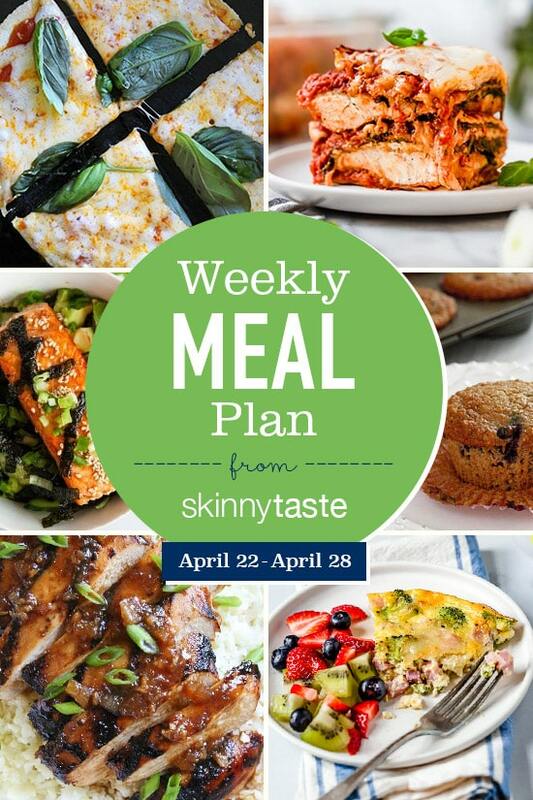 The post Creamy Nutritional Yeast Dressing appeared first on Eating Bird Food. 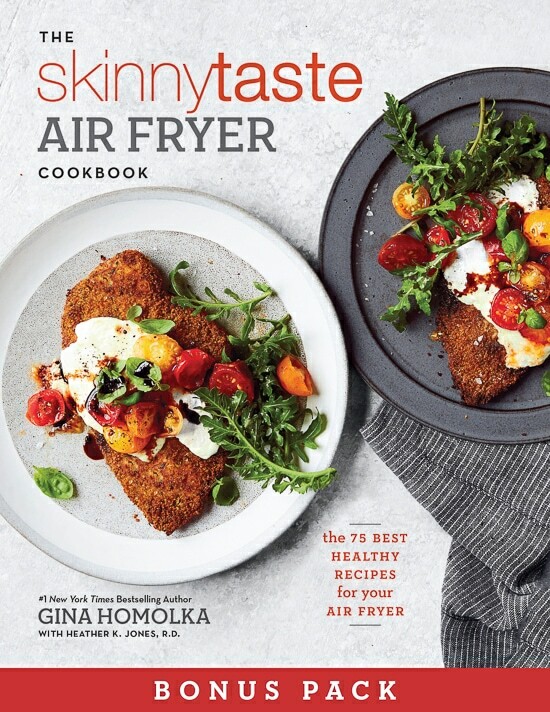 Youre invited: Our Chicago Cookbook Launch Party! 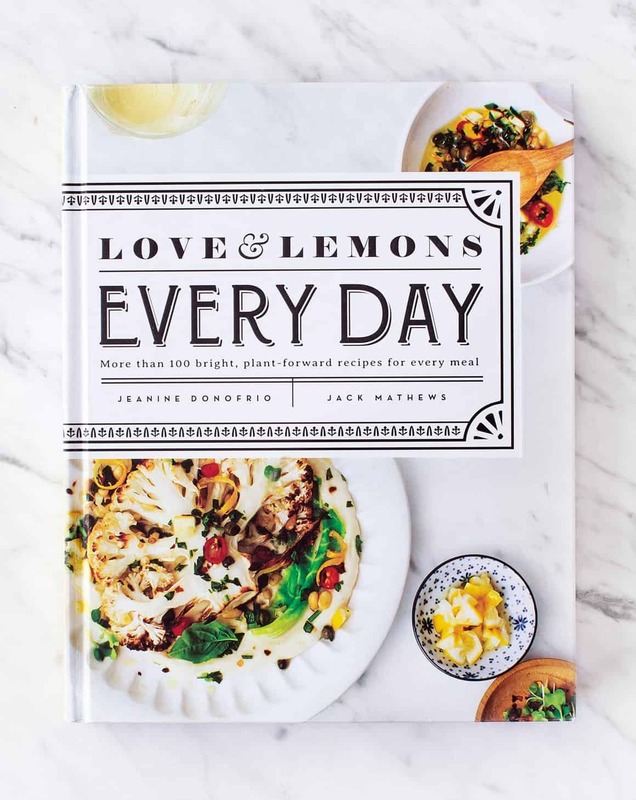 Hey Chicago friends – you’re invited to my book launch celebration for Love & Lemons Every Day this Thursday at Williams Sonoma in Lincoln Park! I’m going to be doing a fun cooking demo and signing books. I hope to see you there! The post You’re invited: Our Chicago Cookbook Launch Party! appeared first on Love and Lemons. This moist cake—scented with orange zest and crowned with ruby pink, tart rhubarb—is a keeper. It has plenty of appeal and it earns it! You can whip it up at the drop of a hat in the food processor. Very little washing-up is required, and I always vote for that. Rhubarb is in season primarily from April to June in the U.S., but you can sometimes find it a little earlier or later than that. Look for stalks that are less than two inches in diameter and that are blemish-free and firm. You don’t have to peel them. Their color can range from green to pink to deep red. If the stalks have leaves, they should look fresh, not wilted. The leaves of rhubarb are poisonous, so be sure to remove and discard them. Store the stalks, unwashed, in a plastic bag in the refrigerator for up to one week. If you have a good haul of rhubarb, you can cut the raw stalks into pieces, spread them on a parchment-lined baking sheet to freeze, and pop them into freezer bags once they are frozen. They should keep for up to 12 months. Personally, I prefer the flavor of toasted almonds and the slightly coarser texture that comes from grinding the nuts in the food processor to make my own almond flour. But if you don’t have the time or the inclination to make your own, you can substitute store-bought almond flour in this recipe. CAN I USE A CAKE PAN IF I DON’T HAVE A SKILLET? You can use a 9- or 10-inch round cake pan that is at least two inches deep for this cake. I suggest buttering the pan and then lining the bottom with a round of parchment paper to fit. Check the cake for doneness after about 40 minutes, since baking time can vary according to the pan you use. The cake is best eaten on the day it is made, but having said that, it keeps well for two to three days, covered tightly with foil stored at room temperature. To freeze the cake for up to three months, wrap it in plastic wrap then aluminum foil. 1 Heat the oven and prep the skillet: Preheat the oven to 350ºF. Generously butter a 10-inch ovenproof skillet with a heatproof handle. 2 Toast the almonds: Spread the almonds on a baking sheet and bake for 8 to 10 minutes, or until they smell toasty. Cool briefly. 3 Grind the almonds: In a food processor, add the almonds, 1/4 cup of granulated sugar, and orange zest. Process until the mixture looks like coarse sand. Transfer the mixture to a bowl. Remove 1/4 cup of the almond-sugar mixture for the topping and set aside. 4 Combine the almonds and flour: Add the flour, baking powder, and salt to the almond-sugar mixture in the bowl. Whisk to combine. 5 Make the batter: In the food processor, process the butter and the remaining 1/2 cup granulated sugar for 1 minute, or until light and fluffy. One at a time, add the eggs, processing for about 30 seconds after each addition and scraping down the sides of the food processor with a spatula. Add the vanilla and pulse to mix it. Add the flour mixture to the food processor and briefly pulse the machine 4 to 5 times, just until the batter is smooth. It will be thick. 5 Transfer to the skillet and top: Scrape the batter into the skillet, spreading it evenly in the pan with the back of a spoon or small spatula. Sprinkle about half of the reserved almond-sugar mixture over the batter in the pan. Distribute the rhubarb over the top of the batter. Sprinkle with the remaining almond-sugar mixture. 6 Bake the cake: Bake the cake for 50 minutes, or until a toothpick inserted into the middle of the cake comes out clean. Set the skillet on a wire rack to cool to room temperature. Sprinkle with powdered sugar and cut into wedges. Serve from the pan. Hello! All photos and content are copyright protected. Please do not use our photos without prior written permission. If you wish to republish this recipe, please rewrite the recipe in your own unique words and link back to Rhubarb Almond Skillet Cake on Simply Recipes. Thank you!